Hangman's Knot is the only film ever directed by Roy Huggins. He would later go on to create and produce such television series as "Maverick" and "The Rockford Files". As his sole directorial effort for the big screen, this was a fine effort. The film begins with a group of men (led by Scott's character) waiting for what we soon learn is a Union army shipment of gold. They attack, resulting in all but one of the Union soldiers being killed and we then learn they are undercover Confederate soldiers. The one surviving Union soldier surprises the youngest and untested member of the Johnny Rebs who fires out of sheer reaction. Before he dies, he tells them that the Civil War is over...it had ended about a month before. They're not sure they believe him but they find out this is the truth when they go to meet their contact. That man obviously was trying to cheat them of the gold and his reward is to be shot dead by the group's hothead (Marvin). They load the gold into the man's wagon (disguised as an elixir salesman's wagon) but on their way out of the area, they meet up with what they first think is a posse but later find out they are just drifters out for the gold themselves. They take off when the drifters are tricked into believing someone already captured them. They lose the wagon (the horses break lose from it) but are able to stop and board a stagecoach. The drifters are soon back and giving chase but the band on the stage manage to reach and board up at a stagecoach way-station. The rest of the film deals with Confederates (and the civilians with them) trying to survive as the drifters try to get at them...and more importantly at the gold. All the movies I will be watching will be on DVD and I hope they all look as good as this one. The picture quality is incredibly good, especially the outdoor chase scenes where they're riding out in the plains around huge rocks. 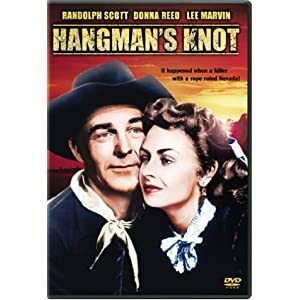 Donna Reed isn't someone you expect to see in a western but she and Scott have good chemistry and the film has a fine cast with lots of familiar faces from Lee Marvin to Claude Jarman Jr. of "The Yearling". There is no music composing credit so perhaps they simply used stock footage for this film. The movie is fast-paced and clocks in at a mere 81 Minutes. Usually movies that are this old don't come with extras (unless they're special editions of Oscar-winning films) but this DVD did come with a trio of movie trailers...not for this film but for Cowboy (the trailer introduced by Jack Lemmon), Once Upon A Time In Mexico and Silverado. Cast: John Wayne, Lloyd Nolan, Walter Abel, James Arness, Andy Devine, Paul Fix, Harry Carey Jr. Being the John Wayne fan that I am, I enjoyed seeing this one...a film starring the Duke that I had never seen before. 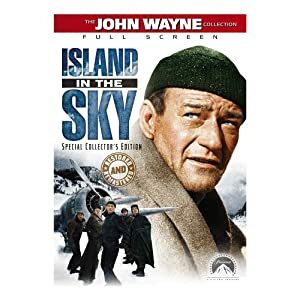 In this film, a transport plane (whose crew is led by Wayne) goes down in snowy Labrador and the crew's buddies set out in their own planes to try and find and rescue them. I found the film got more interesting the further it got...possibly because I was becoming more familiar with the characters played by a lot of familiar faces (including Fess Parker who is seen only fleetingly). While the rescue mission is going on, the downed plane's crew has to try to stay alive with little food and in sub-zero temperatures. I thoroughly enjoyed this film.